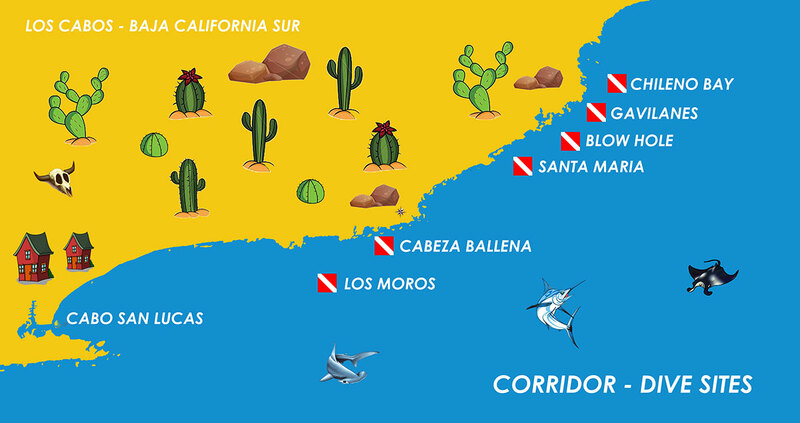 Along the 18 mile tourist corridor between Cabo San Lucas and San Jose Del Cabo there are 5 great dive sites. The topography of this sites are very different from the ones at the Cabo San Lucas Marine Park. The boat ride to the sites takes anywhere between 10 and 30 minutes from the Cabo San Lucas Marina. Schools of dolphins and jumping pigmy manta rays are often seen on the way to the dive sites. The Corridor dive sites are also less crowded than the ones in Cabo San Lucas so many people choose to dive here. This shallow dive site starts in only 5 feet and ends in a sandy bottom at 50 feet. The coral growth is superb and is complemented with large numbers of tropical fish. This spot is also known to be home of a school of spotted eagle rays which are very relaxed and quite often get up close and surround the divers. In addition a wide range of marine life can also be found here including sea turtles, octopus and moray eels. It is sometimes possible to find large schools of pork fish and snappers on the sandy bottom next to the reef. Furthermore you can often enjoy the sound humpback whales singing underwater. Between “Santa Maria” and “Chileno” there is a small bay with a beautiful reef in the center. The top of this reef is in only 5-30 feet and covered in coral. This is probably the best coral reef in Los Cabos. Most noteworthy are the lobsters, angelfish, groupers, several types of rays, white tip reef sharks and much more. This dive is suitable for beginners and more advanced divers and one of our favorite Corridor dive sites. This is a lively, protected reef that starts at 100 yards off the shore of “Chileno” beach and extends out into the bay for about a half of a mile or so. The reef ranges between 5 and 60 ft and is covered with sea fans. Sometimes we get to see mantas, large sea bass, sea turtles and nurse sharks. Invertebrates like Starfish, Flower Urchins and Hydroids are also common. It is also a very appealing site to the beginning diver or snorkeler. Here you will experience very shallow and calm waters making it accessible for a types of divers of snorkelers. This site starts on the souther side of the protected Santa Maria bay in only 10 feet and gradually drops down to 45 feet. The shallow reef is teeming with marine life like Surgeon and angelfish, porcupinefish, pufferfish, groupers and hogfish. Also Snappers, moorish idols, nudibranches, flatworms and several species of rays have made this site their home. In general there is no current but sometimes divers feel the surge from the waves. This spectacular site which got its name from a small blowhole in the cliffs nearby. Massive boulders and crevices form the reef of this spectacular and also exciting dive. Many types of rays, turtles, schools of jacks, puffer fish and groupers are common inhabitants here. There is also a small wall on the northern side which drops from 50 to 100+ feet. This dive is suitable for beginners and professionals.